Compared with the ancient palaces and cathedrals of Europe and Asia, the story of the General Motors building — a 1960s office block in the heart of Manhattan — has hardly begun. Yet in its 50-year lifetime, as Vicky Ward describes in her grippingly readable account of its history, the GM building has witnessed as much human greed, arrogance, high drama and tragedy as any elegant Venetian palazzo or fortified Scottish castle. It all began in 1964, when the property developer Max (later Lord) Rayne snapped up the Savoy-Plaza hotel on Fifth Avenue. Together with his trusted colleague, Cecilia Benattar, a 32-year-old Mancunian with the negotiating skills of a pit-bull terrier, Rayne eventually purchased the entire block, evicted the various tenants and persuaded General Motors that this would become the most prestigious office building in New York. The former editor Daily Mail editor, Sir David English, then a New York correspondent, wrote that in closing the deal with GM, Benattar, the ‘houswife tycoon’, had pulled off the ‘business shock of the year’. The architect Edward Durell Stone, who designed the British Embassy in India and the Kennedy Centre in Washington, DC, won the commission to build the 50-storey white marble tower on the Savoy-Plaza site. Despite protests from New Yorkers, including the economist J. K. Galbraith, who complained that ‘Americans spend $5 billion a year visiting the historic shrines of Europe, and then spend the same amount tearing down their own’, tenants flocked to the new building. Cecilia Benattar was so busy wheeling and dealing that in 1969 she gave birth to her fourth child on a Friday and returned to the office the following Monday. For the next six months she continued to be preoccupied with leasing, and the infant remained nameless. ‘No one,’ Ward observes, ‘was much surprised’ (the baby was eventually named Judith). There was a popular saying: ‘What’s good for General Motors is good for the country’. But as the Arab oil crisis of 1974 and the recession of the early 1980s struck, the reverse proved also to be true. GM’s fortunes began to slide, and with them, the fortunes of its iconic building, which began to look distinctly neglected. An unlikely saviour appeared in the person of financier Disque D. Deane who, in the rogues’ gallery of unlovable characters that populate Ward’s narrative, is the most unappealing. He kept a stuffed wolf in his office to remind himself that it was a dog-eat-dog world, and his treatment of his wife — whom he divorced with a miserable settlement after 39 years of marriage — and of his four children, whom he used to interrogate about compound interest over breakfast and beat if they got the answer wrong, was startlingly brutal. Having bailed out GM to the tune of $500 million, Deane went into business with Donald Trump (who recalled Deane as ‘the meanest, angriest human being I’ve ever met’). Trump cleaned up the white marble walls, put in new granite floors, and emblazoned his name on the front of the building in 4ft-high brass letters. But in 2001, when he had the chance to buy the entire building for $995 million, he hesitated. Characteristically, he claimed a victory: ‘I don’t like talking about the GM Building, because I’d rather not have lost it, but I did make money on it,’ he said. Trump’s loss was developer Harry Macklowe’s gain. An intriguing mixture of high culture and low cunning, Macklowe enjoyed the company of writers, artists and performers, but he was also infamous for a 1985 scandal in which he demolished four large buildings with the gas still turned on. It was only by chance that no one was killed. Macklowe persuaded Steve Jobs, then CEO of Apple, to open a flagship store sited in a glass cube in front of the GM building. It opened in 2006 and was an instant success. But hubris — the tragic quality at the heart of so many epic downfalls — did for Macklowe. Convinced that he could pull off an even bigger coup, he closed a $7 billion deal in just nine days. It was the biggest leveraged buy-out in history, but in 2008, it cost him the GM building. Now in the vast property portfolio of the media baron Mort Zuckerman, a new chapter of its story is beginning. 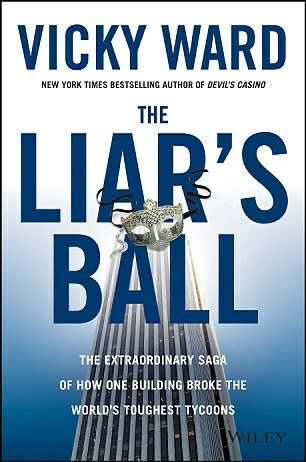 And given the frenzies of desire that the GM building excites among the guests at the ‘Liar’s Ball’ (as the Real Estate Board of New York affectionately dubs its annual gala), the next 50 years seem certain to be a thrillingly bumpy ride.